*6 Extras! Free Monthly Brother iBroidery.com Designs, Creative DRAWings My Stitch Editor and Sizer Embroidery Software, Wilcom TrueSizer Format Conversion Software, 21 Exquisite Stabilizer Samples, Inspirations Thread Color Conversion Software, Designs in Machine Embroidery Magazine offer. *Brother ELS-1 is a Brother "Baby" BES or BES Light. See comparison chart for Brother BES features that do come with ELS1. For Brother SE LB PE PC NS and NV Models from 4x4" up to 5x7" designs. 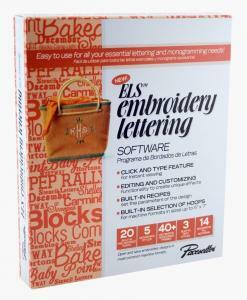 Compatible with the most popular brands of embroidery machines and software, the ELS Embroidery Lettering Software has an easy-to use workspace with convenient icons making it ideal for first-time lettering software users. Featuring 20 built-in pre-digitized fonts, 5 monogram styles, 40+ decorative monogram frames, 3 built-in text styles and 14 decorative fill patterns! Comparison Chart of Brother BES and ELS1 (up to 5x7" hoops) Lettering Software Programs.